Most adventurers aren't too picky which holy symbol the cleric has on his shield. Their only concern is that he's following a deity that grants healing spells. Oh, and if he could put that shield at the front of the party, that would be swell, too. But not all gods are created equal. Some are rather nice. Some are bit temperamental. Some require their priests to wear silly hats. Some only grant spells that turn chickens into wine. Point is, there are lots of different kinds of gods. So why aren't there lots of different kinds of clerics? Well, now there are! 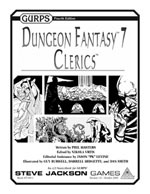 We've got a book called Dungeon Fantasy 7: Clerics that addresses this very issue. It offers up 15 different kinds of deities to worship, and lays out how the holy men and women for each one would work, and suggests appropriate rules stuff. Oh, and on page 36, there's a bit about a magic weapon called a "Sacred Shovel of Zombie Beheading." Enjoy!